Turfmend Sun & Shade mix is ideal for all states in the Midwest, northeast northwest and through the middle of the US. Will not be suitable for Southern turf types, soil and heat. They say that we are the sum of our experiences in life. For Jeff Stahman there is no truer statement. Jeff’s life experiences have led him to where he is now, partly by fate, but mostly by keeping his dream in sight and a willingness to do whatever it takes to achieve his dream. For Jeff Stahman, owner of TurfMend, his enthusiasm for turf science started out as a love for the game of golf. As a kid, he played golf with his Dad every chance he got, and this ultimately led to Jeff’s study and pursuit of jobs in the golf course industry. And then he’s passion to design and manufacture the best turf seed on the market. While attending Albertson College of Idaho, he worked on the maintenance crew at BanBury Golf Club. During that time, he learned golf course maintenance at the ground level (no pun intended), doing all the different jobs required to maintain a golf course. After two years at Alberston College of Idaho, Jeff transferred to Kansas State, during his time there, he served as an intern at two of the top golf courses in the state of Washington. During his final year at Kansas State University, he had the opportunity to participate in the Study Abroad Program in Palmerston North, New Zealand, at Massey University. In 2004, he graduated from Kansas State University with a degree in Agriculture and a minor in business administration. In August of 2017, Jeff was encouraged to patent the divot mix he had used as a golf course superintendent by his former business partner who was also a golf course superintendent. Together, they founded TurfMend. Shortly thereafter, in April of 2018, they had the good fortune of signing a blending agreement with Barenbrug USA out of Tangent, OR. After less than a year together, Jeff bought out his business partner and TurfMend began to really take off. Currently, TurfMend is being distributed by ten companies and Jeff is working diligently to make it a nationally recognized product. TurfMend would never have got to where it is today without the support of his loving wife of almost ten years Amy and his two sons Parker and Paxton. Today, Jeff still finds himself working 80 hours a week but is blessed to have his family by his side while running TurfMend. It’s very common for Jeff to be out making sales calls with his wife and sons by his side. With hard work and a little luck, TurfMend will continue to endure as a business that his young boys can manage when they come of age. Let us show you how passion, experience, education and love for turf all comes together in manufacturing the best seed mix in the industry. PERIOD. TurfMend has the ability to help you repair any bare spot, whether its a divot on a golf course, worn out spot on a sports field or a dog spot in your back yard. TurfMend was developed by a former Golf Course Superintendent so it takes the guess work out of having a perfect lawn, sports field or tee box. It helps reduce labor in a commercial setting and allows a homeowner to buy one product to repair those pesky bare spots in their lawn. 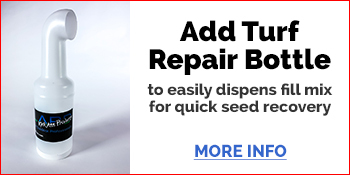 TurfMend truly allows anyone to Repair Bare Spots in a Hurry!